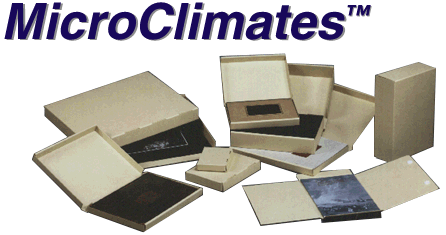 MicroClimates� Archival Acid Free Boxes: Welcome! Archival boxes, custom made to fit a book or item. Why Box? Boxing addresses all of the following factors that cause deterioration: handling; air circulation; pollution; acidity; light; rapid changes in temperature and humidity. MicroClimates can reduce damage by fire, soot, smoke, and sprinkler systems. archival containers are a major leap forward in boxing technology. Compared to the original phased box, they are less expensive, offer better protection, and are quicker to install. Also our clamshell design is more functional and requires significantly less shelf space. acid free boxes are manufactured to your supplied measurements, in sequential shelf order and shipped, ready for assembly in the same order. We offer clamshell, four-flap, two piece, and two piece drop front designs. They are made from the finest quality material, acid free, high in alpha cellulose, free of lignin, free of sulfur and with an alkaline reserve of approximately 3%. We produce MicroClimates in either 1.5 mm tan corrugated or 1.5 mm grey/white solid core material. Click here to see how easy it is to try our archival storage system and enhance your archiving, preservation and conservation operations.